I am trying to find info on what happened to Celtic Saving and Loan Association. My grandmother had this certificate from 1936 (pictured below). 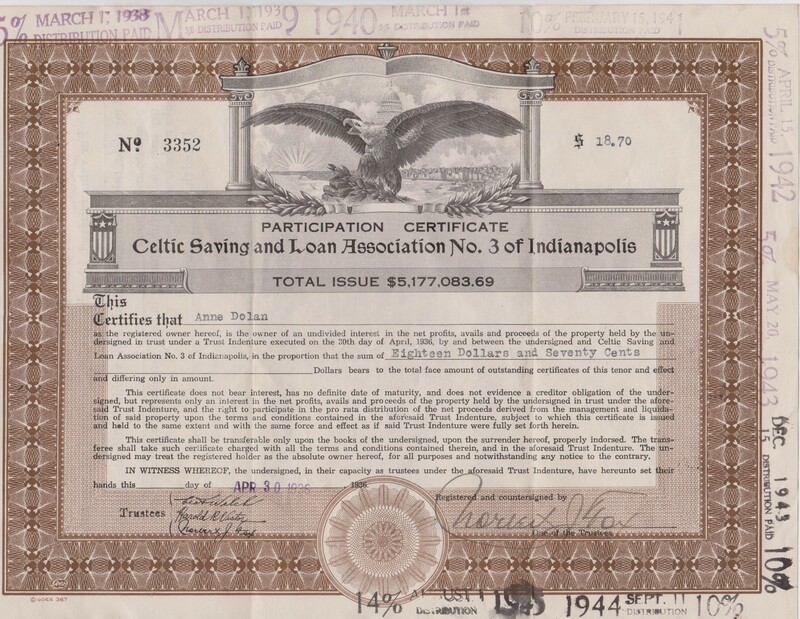 Thanks, Tom D.
Celtic Saving and Loan Association was the first institution in Indianapolis to finance home building projects. Founded in the spring of 1874 by a group of men who lived near one another on the south side, some of its original members’ surnames were O’Connor, O’Brien, Moriarty, Rinehan, Donnehy, and Clancy. As the men were all of Irish descent, they chose the name Celtic to honor the language of their families’ origins. Organized in a grocery on the corner of S. Delaware and E. South Streets, Celtic began with a few hundred dollars from each of its founders. Loans to build or repair homes were made to friends and neighbors at reasonable interest rates. Transactions were initially conducted in a room at the rear of the store. As the number of people in attendance at association meetings increased, Celtic needed a larger space. In 1884, the group moved to its second location, a meeting hall at the corner of W. Georgia Street and S. Capitol Avenue, adjacent to St. John the Evangelist Catholic Church . There association members gathered every Thursday night to make their deposits and hear applicants’ requests for loans. As Celtic continued to grow, the need for a permanent location and a more structured organization became evident. In 1888, Celtic Saving and Loan Association Number 3 was established. The first person chosen by the members to lead the association was John Richard Welch (1856-1934). 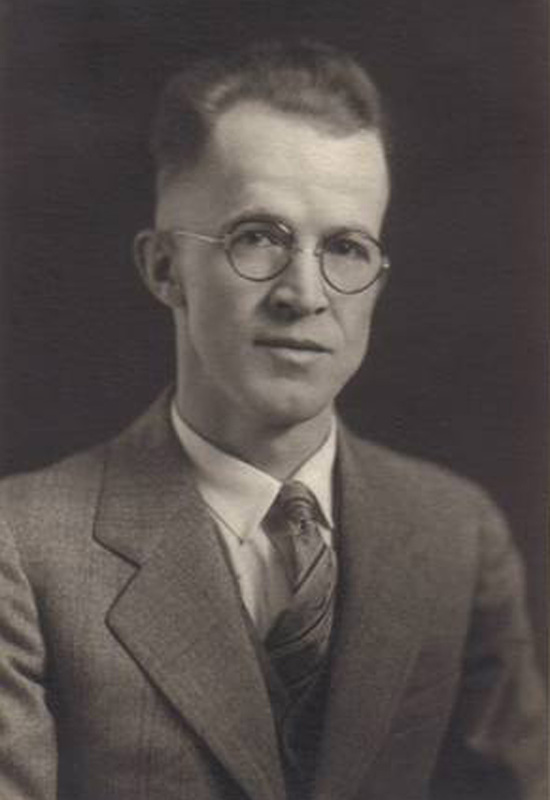 John R. Welch was born in the small town of Warsaw in Gallatin County, Kentucky, just across the Ohio River from the southeast corner of Indiana. His parents, Thomas and Ann Welch, had immigrated to the United States from Dublin, Ireland, less than a year before his birth. When John was 18, the family came north to Indianapolis. 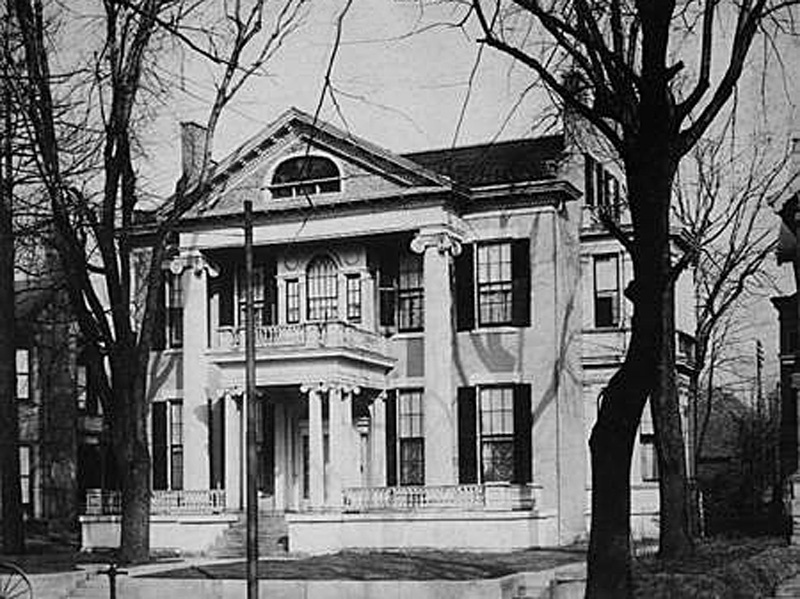 Their first residence was on Blake Street, just north of Washington Street and west of Military Park. 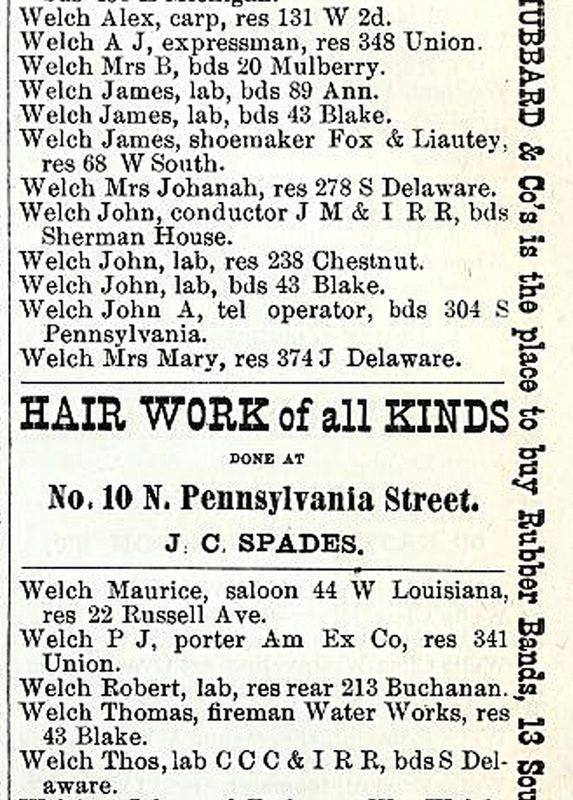 Over the next few years, John Welch worked as a laborer for the Indianapolis Water Company, Kingan & Company Meat Packers, and Woodburn-Sarven Wheel Co. Desiring the education and qualifications that would provide him with better employment, Welch took night classes at a commercial college after his work day ended. He also invested some of his earnings in Celtic. 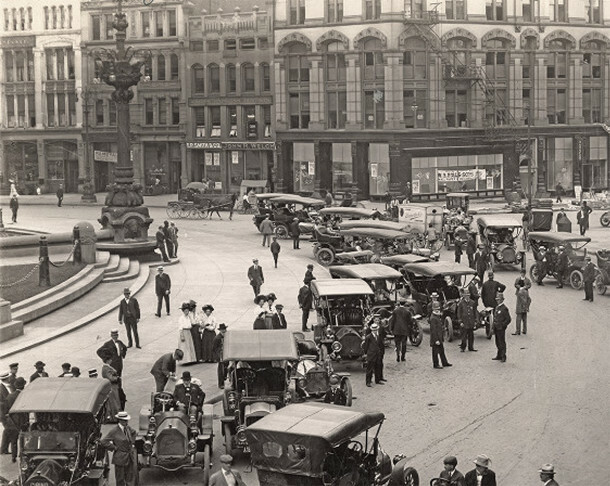 When the newly reorganized Celtic Savings and Loan Association moved into its new office space at 52 Monument Place (now Monument Circle), John R. Welch opened his eponymous real estate and insurance business in the same building. Celtic Savings and Loan Association operated from its offices in the southwest quadrant of the Circle for thirty-five years. In 1923, the building was sold to the heirs of Charles Test, who demolished it and the building next door to it. 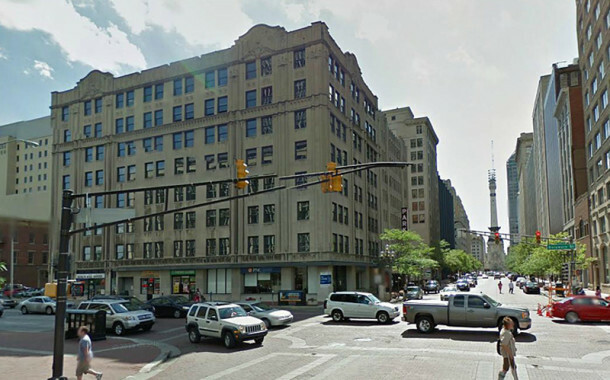 The Test Building was then erected on the corner of W. Market Street and Monument Circle. The mixed-use structure was considered very innovative, as it included one of the earliest parking garages in Indianapolis, the Circle Motor Inn. 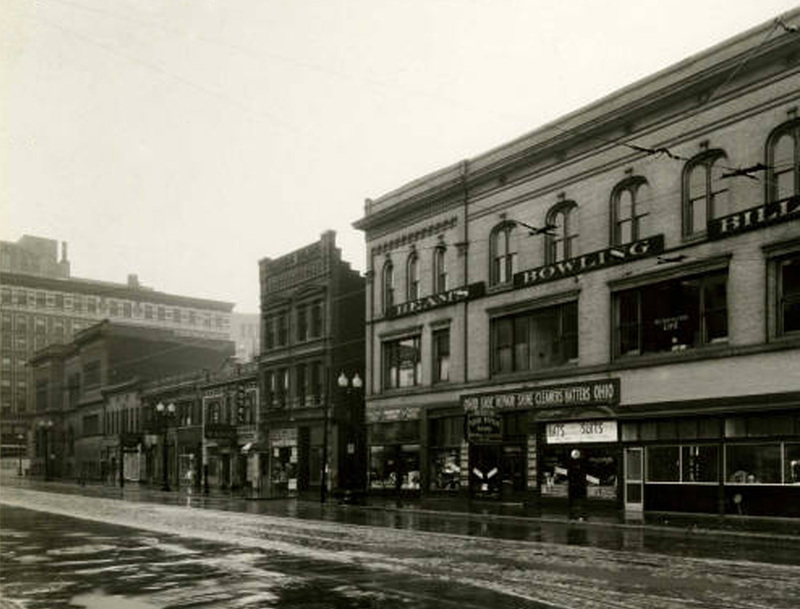 Both Celtic and John R. Welch Co. relocated one block north of the Circle to 23 W. Ohio Street in 1923, where it would remain for the next thirty-five years. 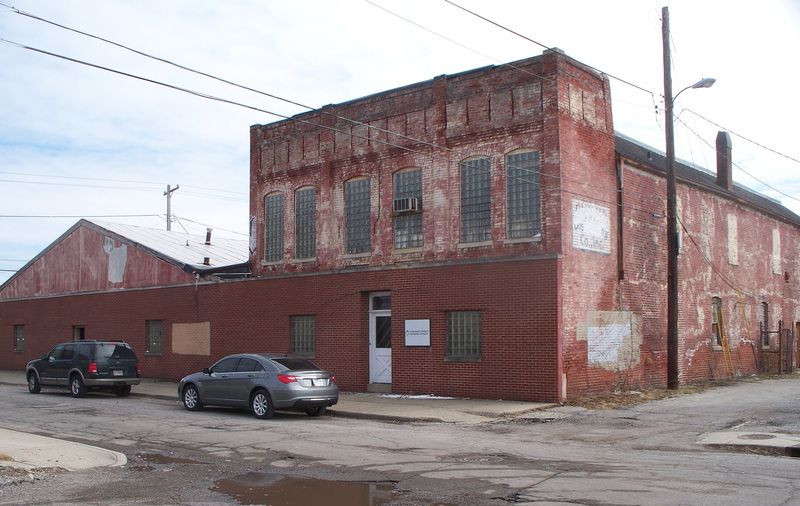 It was located between N. Meridian Street and an alley mid-block known as Bird Street. In 1969, that portion of W. Ohio Street became the site of a Hilton Hotel. Today it is a Sheraton Hotel. Following Leo’s death, his son, John Richard Welch (1923-1989), became the third generation of the Welch family to preside over Celtic’s operations. 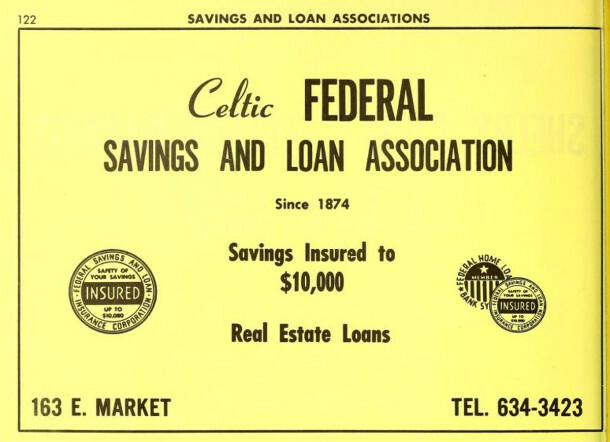 In 1959, Celtic Federal Savings and Loan Association moved to new quarters in the Union Title Building on the southwest corner of N. Delaware and E. Market Streets. Within a few years of Celtic’s move to 163 E. Ohio Street, the practice of mergers had begun to occur. Smaller institutions simply could not compete with their larger competitors, especially after legislation permitted savings and loan associations and commercial banks to establish branches in contiguous counties. Celtic had never had more than its one location, downtown, and it was not economically feasible to begin building suburban branches at that time. 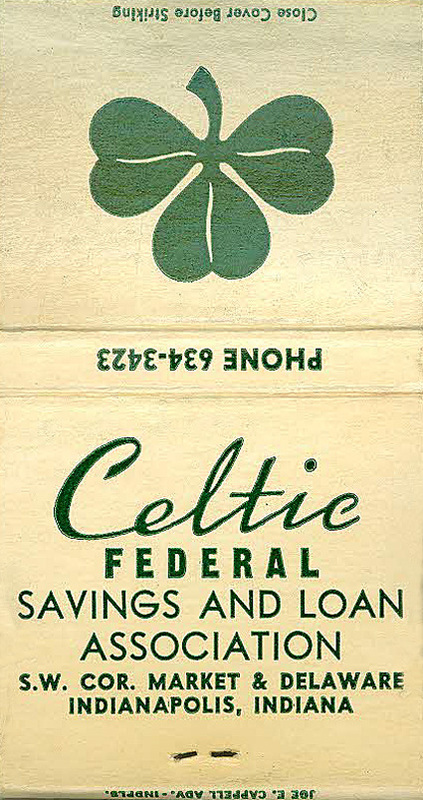 In 1966, Celtic made the decision to merge with First Federal Savings and Loan Association. First Federal was a relative newcomer in the S & L arena. Founded in 1934, it had grown to six branches by the Sixties. Celtic closed its doors on December 19, 1966. Its employees moved over to First Federal’s main branch at 1 N. Pennsylvania Street and were absorbed into the First Federal staff. John R. Welch became Senior Vice President of First Federal. After retiring from First Federal, he was a real estate broker for a few years. He passed away in 1989. 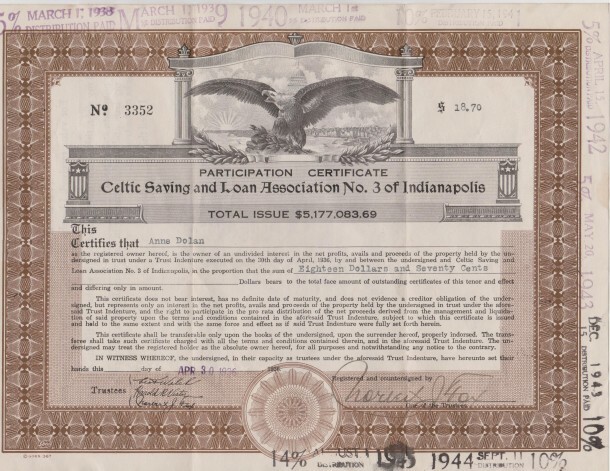 Celtic was clearly the pioneer of the savings and loan industry in Indianapolis. Besides being the first, it also had the longest run of any S & L under an entity’s original name — ninety-two years. Celtic assisted thousands of people in owning their own homes. 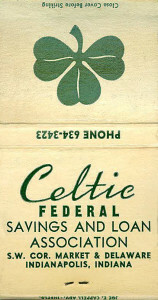 Other associations that sprang up in the decades after Celtic was organized included Turner Building and Savings Association, Speedway Savings and Loan Association, Arsenal Savings and Loan Association, Railroadmen’s Federal Savings and Loan Association, and Fletcher Avenue Savings and Loan Association. Eventually, First Federal became a commercial bank, called First Indiana. It was acquired by Wisconsin-based Marshall & Isley aka M&I in 2008, and then by BMO Harris Bank of Montreal in 2011. 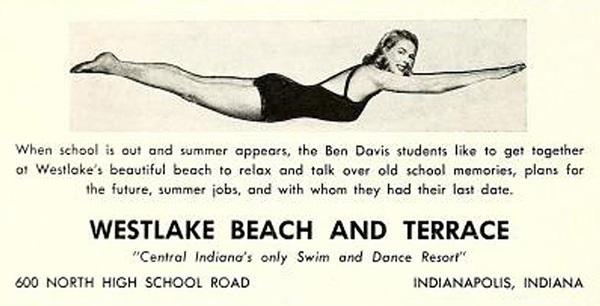 Apparently many of these S&Ls were founded to assist various groups of new arrivals in Indianapolis who, after getting established in Indianapolis with employment, and who were not a “favored” group as determined by established banks to make loans to. Like you mentioned, Celtic S&L was founded largely for Irish immigrants. Another example might be Railroadmens S&L for railroad workers, Arsenal S&L (maybe for east side workers? ), and maybe Turners S&L (maybe for German Americans, as in German turners? As in Turnverein members?). One interesting thing about the former Merchants National Bank: the first train reaching Indianapolis on the JM&I RR was operated by a railroad engineer (a German immigrant, or a descendent thereof?) named Otto Frenzel. He relocated to Indianapolis from Madison with the railroad and soon realized he and his fellow railroad workers were not “favored” for building or business loans by the established banks. Therefore he founded his bank to provide loans to fellow railroad workers as approximately a dozen railroads focused on intersecting at Indianapolis and therefore railroad workers became a significant market for building and business loans, and Mr. Frenzel picked up on that. Just my take, Sharon! Slice me if I got my facts wrong!.. I agree with you that many of the savings and loan associations were initially created to serve particular constituents. The common bond for each association may have initially been different — their ancestral roots, their neighborhoods, their occupations, their religions, etc. — but as the years went by, I imagine their customer bases expanded. I do think the organizers conceived of these institutions as helping to improve the city, while at the same time making the shareholders a little money. However, I do not know if the associations were started because the people were discriminated against by established banks. I’m not sure how one could confirm or deny that notion. You have mentioned Merchants National Bank. I don’t think John P. Frenzel necessarily established Merchants National Bank to serve railroad workers. Merchants was not a savings and loan association. It was a commercial bank, which was a whole different animal. Also, I think there were other men involved in the founding of Merchants, like Henry Schnull, Volney Malott, and John S. Newman. J.P.’s engineer days were long in his past by the time Merchants Bank was founded, and he had been a businessman in Indianapolis for more than a decade by then. The generations of Frenzels who developed Merchants into a giant in the Indianapolis banking community and who built the Mechants Bank Building at 11 S. Meridian Street were John Peter’s (the engineer’s) sons, grandsons, and great-grandsons. They were either children or not yet born when Merchants was founded in 1865. On a personal note of interest . . . I am related to one line of John Peter Frenzel Sr.’s descendents. 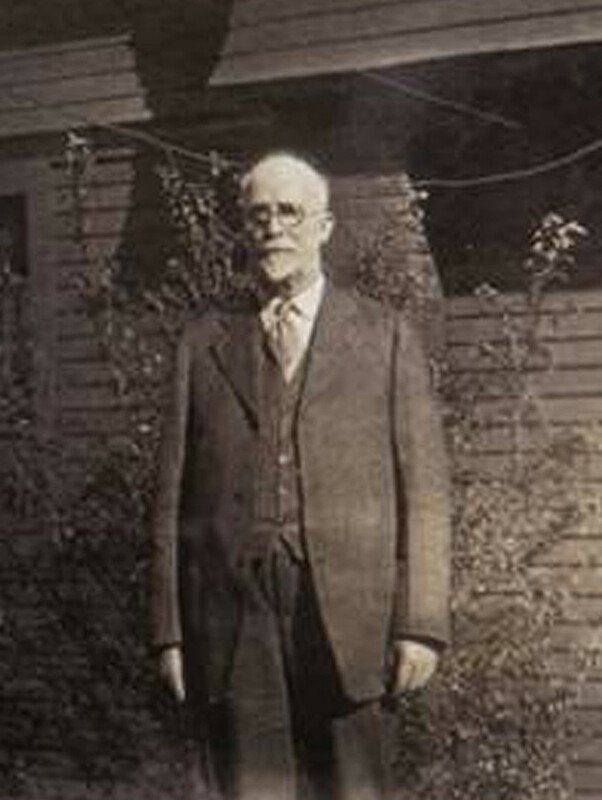 J.P.’s son, Otto Nicholas Frenzel, Sr. (1956-1925), married Caroline Goepper (1859-1940). Caroline’s mother was Susanna Butsch Goepper (1832-1907), who was the younger sister of my great-great-grandfather, Peter Butsch (1812-1864). Peter died during the Civil War. Sharon, I appreciate your insight. I forget where I read it, but railroadmen had issues with getting loans from banks, and Otto (I think that was his first name) Frenzel helped establish what became Merchants National Bank to help railroad workers to help get loans because these workers as well as meatpackers, etc., also were not favored for loans. Later on, Indianapolis banks didn’t quite “trust” the new auto industry development, and apparently the lack of financial support in Indianapolis constrained local auto makers in contrast to Detroit banks who were more amenable to financing the new auto industry. Don’t have a source to quote, though, unfortunately. That is interesting that you’re related to this civic minded family. impressive! You may be correct. I’m certainly no authority on this. I do have quite a bit of material on the Frenzels, but it was researched twenty years ago (before the Internet), and the hard copies are in boxes in my attic. I’ll have to dig out those family tree files, as I know I have some biographical material on the earlier generations. What’s confusing me is that you think it was Otto. The first Frenzel named Otto that I know about was the one who married my Butsch-descended cousin. That Otto Frenzel was born in 1856. He would have been only 9 years old when Merchants Bank was founded in 1865. His oldest brother, John Peter Frenzel, Jr., was born in 1853. He would have been only 12 years old when Merchants Bank was founded. I am not aware of any Otto Frenzel who was old enough to establish a bank in 1865. If a Frenzel was involved in the founding of Merchants Bank, it just about had to be Otto and J.P. Jr.’s father. John Peter Frenzel Sr. was the only Frenzel who would have been old enough. I’ll look into this and let you know what I find out. Ooops. I may have made a mistake on his first name. I remember your relative by this name with Merchants, but the original Frenzel who drove the first JM&I RR train into town may very have had a different first name. That’s no doubt my mess up there. I do know it was a Frenzel who drove the train and was involved in banking later on, but that’s all I know for sure, plus he did help found it to help his co-workers in the railroad industry. 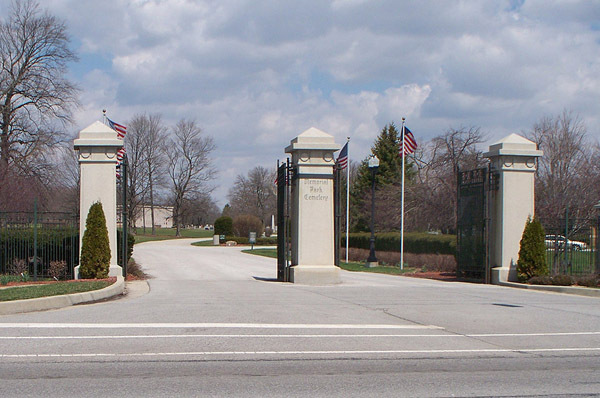 Beyond that you’ve no doubt got more information on your relatives that have contributed so much to Indianapolis’ economic and community development. I found some obituaries and biographies that help to straighten things out. It turns out that NONE of the Frenzels was a founder of Merchants Bank! John P. Frenzel Sr., the engineer who drove the first locomotive from Madison to Indianapolis, was not involved in Merchants Bank at all. His sons were the first Frenzels to be associated with Merchants Banks, and they started at the bottom and worked their way up, so to speak. In 1866, one year after Merchants Bank was founded, 13-year-old John P. Frenzel Jr. became the bank’s messenger. He was the first Frenzel to work at the bank. In 1870, five years after the bank was founded, 17-year-old John P. Frenzel Jr. became teller, and his 14-year-old brother, Otto N. Frenzel Sr., took over John P. Frenzel Jr.’s messenger job. In 1875, 22-year-old John P. Frenzel Jr. became cashier, 19-year-old Otto N. Frenzel Sr. took over the teller job, and their 14-year-old brother Oscar F. Frenzel Sr. became the messenger. In 1882, Volney T. Malott — who WAS one of the founders of Merchants Bank — decided to retire. The Frenzel brothers purchased Malott’s stock. John took over as president, and Otto became cashier. The bank grew steadily during John’s presidency, but he was often distracted by other endeavors. He was elected to the IPS school board and was its president for 14 years. He led the cause for the construction of Manual High School. He helped found the gas company that was the predecessor of Citizens Gas & Coke. He was elected Marion County Treasurer. He was active in the Democratic Party and was a delegate to national conventions. In 1902, John P. resigned from his position at Merchants Bank, and Otto N. Frenzel Sr. became president. Otto was president until his death in 1925, at which time older brother John resumed the presidency of Merchants Bank. I will look into the owner of the land that became the Naval Ordnance Plant when I am able. There are a number of HI Mailbag questions already “in the queue” that I should answer first. BTW, I have many memories of various details about the Naval Ordnance, as my family lived across the street from it for six years. Thank you Sharon for the wonderful information. The company has a very interesting history. If you have no interest in the Celtic certificate itself, I would be happy to purchase it from you for $20.00 plus shipping. 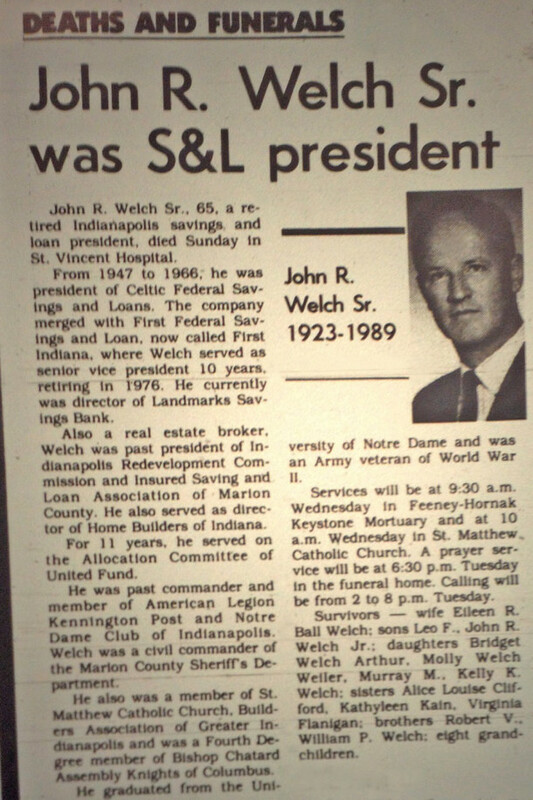 My great grandfather was John R. Welch and my father, also John R., was the last president of Celtic before it merged with First Federal. Thank you so much for your research. I really enjoyed reading the article! The obituary was from the Indianapolis News, not the Star. Ex-Newsies are sensitive to such things! Thanks, Lyle. I stand corrected. Well, actually I sit corrected. The obit was sent to me via e-mail attachment by a librarian at the IMCPL Ask-A-Librarian Desk. In the past, such articles have been (almost without exception) from The Indianapolis Star. I will be more careful to credit the correct source in the future. I was wondering what the certificate actually represents… Is it a receipt saying that you borrowed money from Celtic? Or does it mean the certificate holder lended money in hopes of returning a profit?